1. Remove the outer skin of the mushrooms and wash thoroughly. 2. Gently remove the stalks, chop fine and set aside. 3. Wash the spinach leaves. 5. Chop the green chilli, garlic and onion. 6. Place the spinach in a heavy-based pan with the mushroom stalks, green chilli, garlic and salt. 7. Do not add any water. The water on the spinach leaves after washing them is enough. 8. Place the pan over modearate heat and cook until all the water has evaporated. 9. Melt the butter in a pan over low heat. 10. Add the onion and saute gently until it turns soft. 11. Add the flour and make the white sauce. 12. Sprinkle in the nutmeg, salt and pepper. Set aside. 13. Puree the spinach to a thick paste. 14. 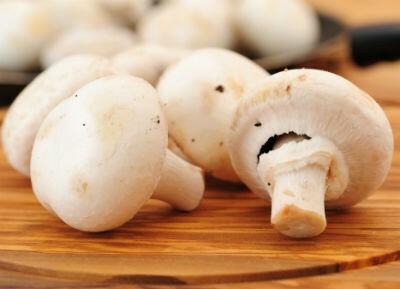 Plunge the mushroom caps into boiling water and remove quickly. Drain thoroughly. 15. Invert the mushroom caps and arrange them in a layer on a greased baking dish. 16. Fill each cap with the spinach paste. 17. Lightly sprinkle some of the cheese on top. 18. Slice the tomatoes and spread half of them over the cheese. 19. Spread the rest of the mushroom over the cheese. 20. Fill each cap with the spinach paste. 21. Sprinkle a little more cheese over them and top with the remaining tomatoes. 22. Pour the white sauce over the layers and smoothen the top. 23. Bake the mushrooms in a preheated oven at 180C for 45 minutes. 24. Remove the mushrooms and sprinkle the rest of the cheese evenly on top. 25. Bake for another 15 minutes or until the cheese melts and begins to get light brown. 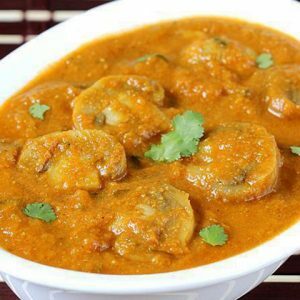 Feel free to comment or share your thoughts on this Spinach-Filled Mushrooms Recipe from Awesome Cuisine.